A Lead goes around the world. From lead to sales opportunity to delivery contract. xRM@EVU offers a complete sales cycle complete with offer and contract management. Why take the easy route, when you can do it even easier? Generic mass E-Mails are so 2004. Personal contact is what your customer wants. Never has personal marketing been so easy. Define a target group of your choosing, create a broadcast and you’re good to go! A happy customer is a good customer. xRM@EVU offers a fully-fledged customer service management. As well as professional complaint and contract management, it also allows for processes like metre readings, making your service more efficient. Be it rates, products or individual calculations, xRM@EVU comes with professional and clean offer management. Just print your offer to a template and send it off. It’s as easy as one, two, three. Connect your databases! Thanks to the Common-Data-Model of Microsoft Dynamics 365 the integration of billing systems is as easy as ever. NAV? SAP IS-U? Any other billing system? No problem. All the important information at a single click: Thanks to intelligent analysis and display of all technical and commercial master data of your customer, xRM@EVU helps you keep a complete overview. The xRM@EVU Portal allows access to the CRM system from the outside of your organization, without needing an extra user license for Dynamics 365. This makes the Portal ideal for things like a customer interface. How much effort should I put into my customers? Whats is the potential return? How high is the termination probability? Using individual criteria a customer value is calculated and displayed e.g. as a number or traffic light. xRM@EVU offers load profiles and load gears primarily to calculate electricity consumption and consumption peaks in offer management. Customers without load gears can be assigned a load profile. Network Operators can be recorded as business partners and managed with their specific codes, e.g. ILN or EIC, in xRM@EVU. They can be used for a number of tasks, like offer management or analyses. Some things just happen on their own. Thanks to intelligent workflows lots of processes can be automated. Want to send an E-Mail to a customer? An activity to a co-worker? Workflows can be easliy created and managed, even without coding knowledge. xRM@EVU offers credit checks for sales leads and customers in real-time, e.g. with CreditReform. The result can be displayed as a number or traffic light. This will allow you to easily track who you want to do business with. Technical Master Data in xRM@EVU. Link your technical data together. From premises over points of delivery and equipment to registers and register data – everything is synchronised and saved in xRM@EVU, making your data structure better. Your CRM is only as good as its data. Secure your data quality by checking and validating your master data, like company name, postal address, telefon number and E-Mail address – including duplicate checks. Hand in hand with Office. Microsoft Dynamics 365 and xRM@EVU are strongly connected to Office 365. Synchronise your appointments, contacts, activities and E-Mails with Outlook or print offers and marketing campaigns in Word. We offer a multitude of helpful extras for Microsoft Dynamics 365 that make your employees daily working routines even easier. We will show you what we have to offer. Just contact us and arrange an appointment. Love at first sight. 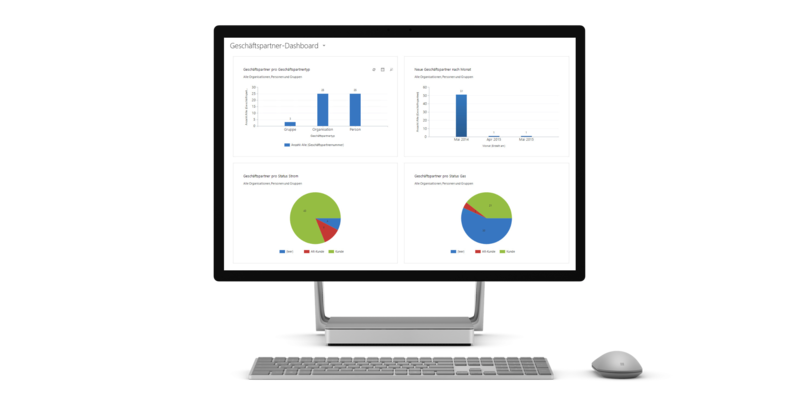 We will show you Microsoft Dynamics 365 in every detail. Contact us via E-Mail or call us to arrange a presentation. We will focus the demo on the parts of the system you are most interested in.